The Ping G10 irons feature an oversized deeper cavity back that allows more weight to be moved to the lower edge of the toe and perimeter for a higher moment of inertia. Its wide sole design provides more forgiveness through impact and assists in creating a higher launch angle. It also features a new Custom Tuning Port that stabilizes the hitting area, producing consistent ball speeds across the entire face. Its progressive offset allows for maximum confidence on long irons, and inspires a go-for-the-pin attitude in the short irons. The deep cavity back allows weight to be concentrated on the lower edge of the toe and perimeter to increase the MOI for more forgiveness. The Custom Tuning Port (CTP) stabilizes the face and allows weight which to be repositioned to the club's perimeter for maximum forgiveness. The elastomer CTP insert produces a solid feel and sound. The wide sole provides forgiving ground impact and allows for optimal launch conditions. Long irons have more offset to promote consistency and forgiveness. Short iron have less offset for more control on approach shots. Review by Warrington, 3 years ago. 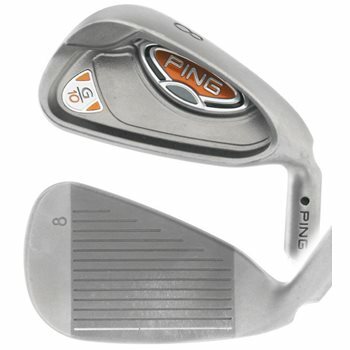 In order to determine what lie angle is best for your height and swing, you will need to go through a club fitting for Ping irons at an authorized Ping retailer/club fitter. They can also fit for length.